raised stainless steel 6-1 pulley with oversized rollers, thermo-formed base pad and interactive rigging guide. All battens are rods. For 2014, sizes 5.0 and larger have an upper panel made of UDL04/technora. This lightens up the weight in these larger sizes. 2013 Phantom. With its leech cutout just above the boom this sail offers great handling due to the shorter boom length. 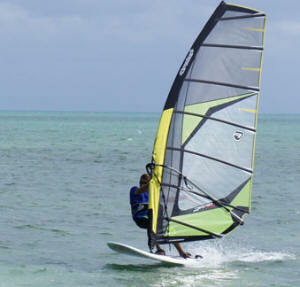 This sail is a wave sail first, but due to its stability and power it crosses over to freeride and bump-and-jump use quite well. 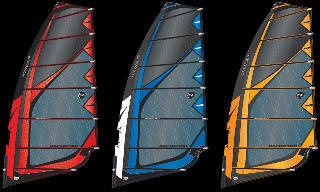 The Phantom's ultra durable 100% grid construction and huge range make this sail one of Aerotech's most popular models. Construction: This model features a 100% grid construction for the ultimate in durability and UV resistance. Other features include; an anti-chafe bumper in the head, new raised stainless steel 6-1 pulley with oversized rollers, a thermo-formed base pad and interactive rigging guide. Durable rod battens are used in this model. For 2013, sizes 5.0 and larger have an upper panel made of UDL04 / technora. This lightens up the weight in these larger sizes. on a large variety of boards. 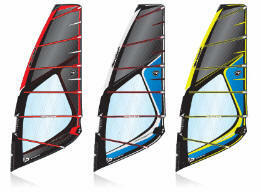 The FreeSpeed is a no cam slalom sail designed for fast freeriding. It’s built tough and has a very powerful shape. are used in this sail. 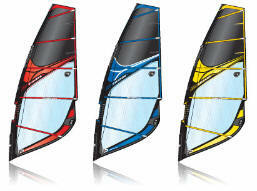 The windSUP is all about bringing windsurfing back to a simpler time with a few modern touches. The sail can go from the roof of your car to the water in under a minute. Just pull the mast bag off, fold the boom down and roll the sail out. Attach the outhaul and you're ready to go! With its vertical battens, this sail offers the convenience of keeping the sail on the mast but still maintains a modern outline with a fat head and increased area below the boom. 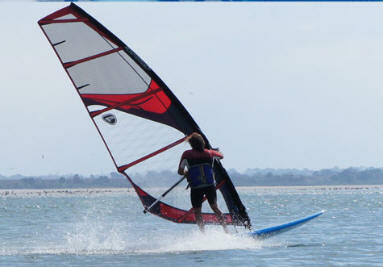 Pop this on an SUP or any longboard and remember how fun windsurfing can be in 5 to 10 knots of wind. tension. Moderate sleeve width and camber inducers give it maximum range and speed. with oversized rollers, and an interactive rigging guide. 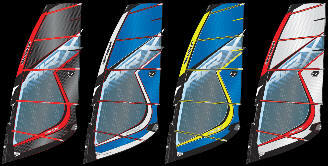 luff panel as well as slightly wider sleeve improves power and gives this sail a 'race sail' feel. Construction: This model features 100% grid construction for the ultimate in durability and UV resistance. Other features include; micro roller cams, a raised stainless steel 6-1 pulley with oversized rollers, and insignia tape reinforcing.A mixture of rod and tubular battens are used in this sail. Sizes 7.0 and larger have an upper panel made of UDL04/technora that lightens up the weight in the larger sizes. A favorite of beginners, students, instructors, and schools around the world! 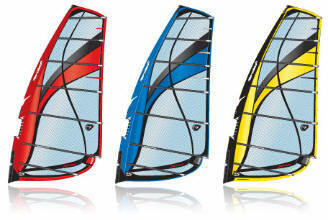 The trainers are ideal for light wind areas or for smaller sailors. The trainers feature dacron construction with durable vinyl windows. They are built tough and made to last. These sails are pinhead style and have no battens. They roll up easily on the mast to practice self-rescue or for storage. All sizes have an adjustable head and all are available in rig packages. A favorite of beginners, students, instructors, and schools around the world! 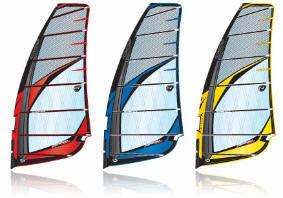 The FUN sails are the big brothers of the trainers and are best for light wind areas. 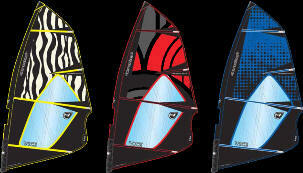 These are our most popular sails for teaching adults. These sails feature dacron construction, vinyl windows and one head batten. They are built tough and made to last. All sizes have an adjustable head and all are available in rig packages. Great sail for recreational sailors who are tough on equipment or who rig in less than ideal locations. A favorite of schools and rental sites. rigging and improved rider feedback resulting in rapid skills improvement. 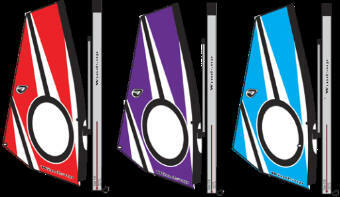 The VMG is Aerotech’s all out race sail. This model has been tweaked on the winning ways of the earlier model. With even more shape and double vertical shaping panels you will find it has an even wider range while maintaining the slippery feel that the VMG stands for. The exclusive use of exotic materials (and no monofilm) for the construction allows weights to be kept to a minimum and performance kept to a maximum. Construction: This sail is built out of 100% grid monofilm and features an ultra light weight Pentex center panel. Other features include; roller bearing camber inducers, a thermo-formed base pad, a new raised stainless steel 6-1 pulley with oversized rollers, and an interactive rigging guide. We use a mix of carbon tubular battens and rod battens in this sail. The Rapid Fire has been updated for 2009. This was the first slalom sail to offer 100% grid construction and that tradition continues. This twin cam slalom series features one cam below the boom and one above. for the ultimate in durability and UV resistance. Other features include; micro roller cams, a new raised stainless steel 6-1 pulley with oversized rollers, and insignia tape reinforcing. A mixture of rod and tubular battens are used in this sail. The UDL04 Technora limited edition version features the ultra light, ultra strong UDLO4 material. 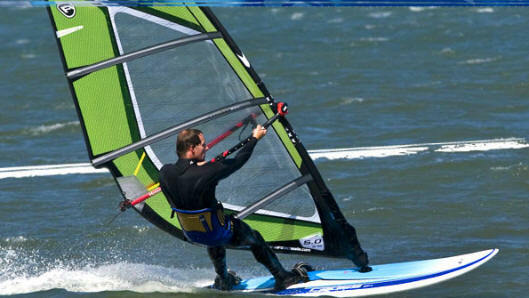 This cloth is substantially lighter and allows the sail to be 10% to 15% lighter than standard models.